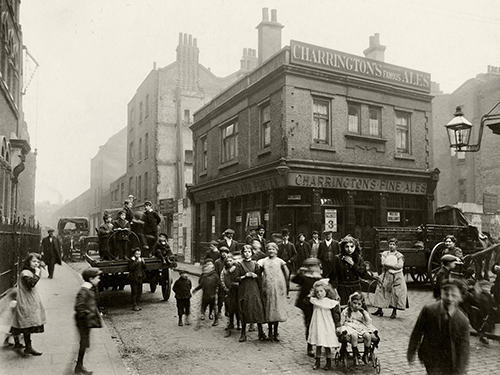 Exhibition: C.A.Mathew: Photographs of Spitalfields a Century Ago. An on-the-tin title there. On Saturday 20th April 1912, Essex photographer C.A. Mathew unloaded his equipment at Liverpool Street Station and spent time taking pictures of the street scenes in Spitalfields. Nobody knows why or how many images he captured. But 21 of them have survived as prints in the Bishopsgate Institute. Some of them are in quite good nick; others somewhat less so. Recently they have been carefully scanned at ultra high resolution and digitally restored by local photographer Jeremy Freedman. The substantially enlarged versions on display are the basis of this remarkable exhibition. The detail is so fine that you can clearly read text in shop windows and on advertising posters and the adverts on omnibuses. The cobbled streets strewn with horse manure. Ornate streetlamps and balconies. Children and parents, in their weekly best, walking to or from synagogue. In the biggest, wealthiest, most powerful and most populous city on the globe, these were its poor, if not its destitute. There is pride in those faces. And curiosity in those of the children. Who was this stranger with his contraption? Horses and waggon wheels are ubiquitous, yet in a handful of years to disappear from this urban landscape forever. This was the generation that – unbeknownst to them – would be scythed on foreign battlefields imminently. And those too young to fight would have their turn a generation later. This show is deeply evocative and real. You can smell and taste the past here. The pixels below can only hint at what you’ll experience by seeing the images in large scale. Do go. 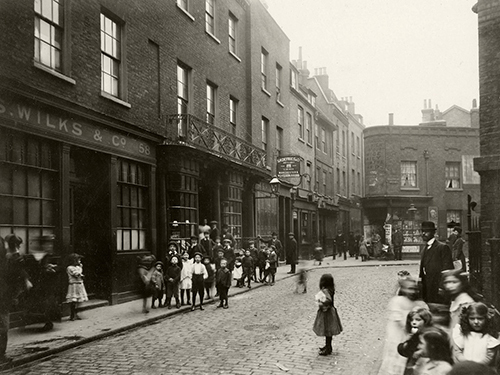 Crispin St, looking towards the Spitalfields Market. Bishopsgate Intitute/Jeremy Freedman. Looking down Artillery Lane towards Artillery Passage. Bishopsgate Intitute/Jeremy Freedman. 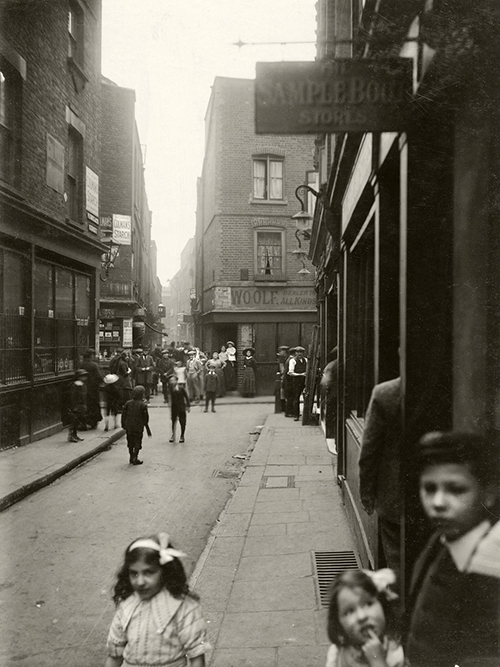 Widegate St looking towards Artillery Passage. Bishopsgate Institute/Jeremy Freeman. The exhibition runs from 7 March – 27 April at Eleven Spitalfields Gallery, 11 Princelet Street. Weekends 12 – 6, weekdays by appointment. More here. More pictures and thoughts by the Gentle Author at Spitalfields Life.